Will Grayson Will Grayson is a novel by John Green & David Levithan published in April 2010. The novel debuted in the New York Times children’s best-seller list after its release and remained there for three weeks. John Michael Green is an American author of young adult fiction , YouTube Video blogger (vlogger) and creator of online educational videos. He won the 2006 Printz award for his debut novel, Looking for Alaska, and his most recent novel, The Fault in Our Stars debuted at number 1 on the New York Times best seller list in January 2012. Aside from being a novelist, Green is also well known for his YouTube ventures. In 2007 he launched the VlogBrothers channel, which he runs with his brother, Hank Green. Since then Green has launched events such as Project for Awesome and Vidcon and created a total of 11 online series, along with his brother, such as Crash Course, an educational channel teaching literature, history, and science. One cold night, in a most unlikely corner of Chicago, two strangers cross paths. Two teens with the same name, running in two very different circles, suddenly find their lives going in new and unexpected directions, culminating in heroic turns-of-heart and the most epic musical ever to grace the high-school stage. 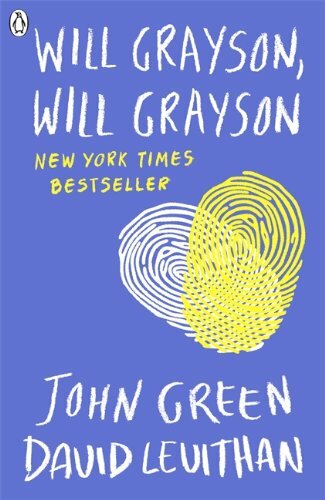 Will Grayson Will Grayson is a lightheartedly funny book about 2 boys, both with the name Will Grayson, who cross paths in the most unexpected way. The book is written in chapters with John writing one chapter about one Will Grayson and David writing one chapter about the other Will Grayson. Despite the book being written this way to avoid confusion and show a differences in the characters, I did find myself slightly confused as to which Will Grayson I was reading about. Apart from this factor I did find the book extremely interesting and it is the first book I have read that explores homosexuality. I also found some of the things the second Will Grayson says highly amusing as he has a different outlook on life. One of my favorite sayings of his is “i do not say ‘good-bye’ i believe that’s one of the bullshitiest words ever invented. it’s not like you’re given a choice to say ‘bad-bye’ or ‘awful-bye’ or ‘couldn’t-care-less-about-you-bye.’ every time you leave its supposed to be a good one. well, i don’t believe in that. i believe against that.” I find this can be interpreted in many ways. However, he is basically expressing how he feels people make quick judgements about everything. I found this book is a very good read and is sure to make you laugh.